Nepali newspaper Nagariknews raised an issue when Nepali actress Nisha Adhikari posted a few photos of hers taken in and around an Army helicopter in her Facebook status. The newspaper questioned the if public is allowed to use the public property belonging to Nepal Army. In response, Nisha was not happy on the journalism practice and told, "the picture they have used was customised for friends only," and not for the journalist to use in their reporting. She accused Nagarik journalists of failing to "understand the caption of the pictures and made the news based on nothing." Although the journalist had called her to talk about the photo, she wasn’t able to talk to them because of poor network coverage and she couldn’t explain things about the photo. 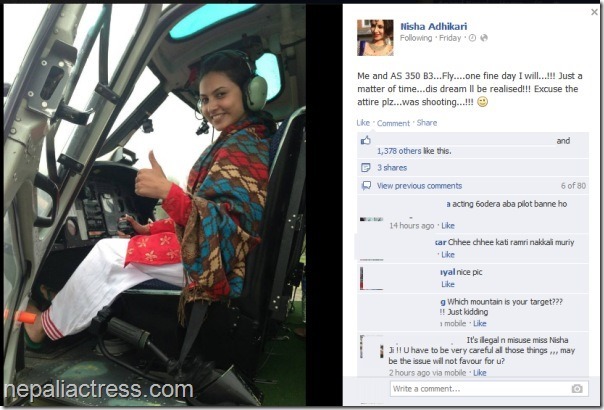 Nisha says she didn’t say that she flew in the helicopter and it was only the photo opportunity. Nisha added, she didn’t travel by helicopter but used a car to travel. Nisha also noted that it was not the first time such news was published based on "pure hypothesis" and she has compiled such cases to include in the book about her Everest experience. She is expecting to publish the book by next year. Another actress, Sumina Ghimire and the director Himgyap Tasi were also with Nisha in the helicopter. The actresses were in far western Nepal for the shooting of their upcoming movie ‘Bhimdutta’. Nisha has recently returned back from the shooting location to finish the shooting of the movie in Kathmandu. This entry was posted in Gossips and tagged Nisha Adhikari, Sumina Ghimire. Bookmark the permalink.